Olivier Lafont is a multi-talented person. In addition to AD films and theatre, he worked in some films as well. Recently we got a chance to read his book – Warrior, which we found a nicely written fantasy fiction. We found his understanding of various mythologies including Indian seems commendable, and he have good command on words as well; which made us curious to know more about him and share it with you all. I am a French author, screenplay writer, and actor. My family moved from France to India when I was young, and I attended the American Embassy School in Delhi, so I have grown up with French, Indian, and American culture. We are impressed with your work as an author by reading Warrior. Your writing says that you must have studied a lot, and not only Indian Mythologies. Can you share your experience of exploring it? I have always had a passion for academia and knowledge, and I have an insatiable thirst for new information, new ideas, new philosophies. When my family moved from France to India I knew practically nothing about Indian culture and history. The most accessible Indian literature for a young boy of my age was Amar Chitra Katha comics, which were a revelation for me on many levels. Growing up I studied many of the philosophies, texts, and histories that make up Indian culture. Since then my exploration has been organic, following the flow of my interests rather than a curriculum. The story of Warrior seems to be in your mind since a long, probably that is why you could have clearly connected the dots from beginning to end. Can you share your journey with the story in your mind. I had just returned from university in the USA to India, and was planning how to move from Delhi to Mumbai. I started writing feature film screenplays while still in Delhi, and one of those was the original avatar of “Warrior”. It was intended to be an Indian film with big budget special effects. I moved to Mumbai to write my first film, and Warrior went into the drawer for some time. The story kept coming back to my mind, but it was only years later that I picked it up again and wrote it into novel form. The central plot is exactly the same, but since it went from a screenplay to a novel it grew and expanded tremendously. What is your favourite Indian mythology / scripture? For me the Mahabharata stands out, not just amongst Indian texts, but in the context of world literature. I find it to be one of the most complex and awesome epics of humanity, given its scale and detail. In fact the Mahabharata was very useful in figuring the scale and theme of Warrior. The Mahabharata has, to me, this massive backdrop of a world at war, where whole nations are battling each other to extermination, set against a personal family feud. I wanted to have a similar feeling in Warrior, so I created what is basically an extinction event and contrasted it to a conflict between Saam and his father, his mother, his half-brother. What you get in feeling when you read “Warrior”, then, is the spectrum from a macroscopic view of the universe to a microscopic view of a human relationship, and the plot plays off this spectrum. Being an avid reader, which are the other authors you love to read? Recently I’ve enjoyed Mark Lawrence‘s The Broken Empire trilogy, Joe Abercrombie‘s books, Brandon Sanderson‘s “The Stormlight Archives“. Fantasy, then science fiction, and then general fiction. Apart from acting and writing, what are your other hobbies? Are you a travel enthusiast? I’m into the UFC, the NBA, and football (Euro 2016 final tomorrow, so “Allez les Bleus!”). I have a bit of a patisserie fetish, I like trying out the new places that seem to open every week in Mumbai. I love travelling — I often travel on work, which takes me to scenic and sometimes remote places, and then I like to travel on my own, where I can go to the places I like best. What are your favourite places (you love Mumbai very much right? ), from India, from France and other countries around the world? In India I love Mumbai, Goa, Manali. In France it’s Lyon, where I grew up, and Paris. I’ve travelled a fair bit, and have really enjoyed the US, England, Greece, Spain. I think travelling is one of life’s great experiences. As you have explored various cultures, what are the key things you found which are same in almost all? What are the specifics you like from each of the culture you have explored? I think all cultures agree on ideas like humanity, family, love, friendship. I’ve always liked the ambitious and productive idea of the American Dream, the French ideology of individual freedom and the relationship of the citizen to the state, the Indian embrace of pan-cultural humanity… These are all ideas that resonate with me. What is the best way you found to manage time between multiple aspects of the life, as you yourself are exploring many tasks like acting in theatres, shooting for advertisements and movies, writing etc? I think it’s about focussing on the specific task at hand and being organised, in your mind as much as in the physical world. Since all my interests are fairly modular it hasn’t been so difficult streamlining them. Do you think your association with visual media helped you in narrations of various scenes in Warrior? I actually wrote “Warrior” before I started professional work in front of the camera, my association with different visual media came after. I do think, however, that I have had a particular affinity to visual storytelling from a young age, having grown up with movies, animation, and bandes dessinées (French comics). What is your favourite scene (of course, if it is the one which can prove spoiler, you can choose second most favourite) in the book? My favourite scene in “Warrior” comes at the end of the story. Without giving anything away, it is a moment of interaction between Saam and his father Shiva, when the God of Destruction’s nature is revealed in all its profound glory. Since I have several occupations I usually write in blocks of time, so I may work on a book or a screenplay for a couple of weeks, then switch to something else. I’m comfortable writing any time of day. In terms of my own writing process, I tend to put down my flow of ideas in a document. Over time the ideas that are more significant will float to the surface and become the stories I dedicate myself to. Then it’s just a matter of scheduling. I think it’s important to write in as much continuity as possible, without leaving long gaps of time between sessions, just to keep the flow of writing. People often like to explore their own world, and so do the authors. For example Ravi Subramanian writes banking thrillers, John Grisham goes for legal thrillers, Maya Kavita writes thriller focused on IT industry. Do you think yourself writing a book based on Ad Word / TV / Movie industry? Sure, could be interesting. There’s nothing in mind right now, but I’m open to it. Writing a book more than 300 pages and get it printed through a notable publisher, is really a tough task. Can you share your experiences of getting Warrior published? It was fairly straightforward, actually. 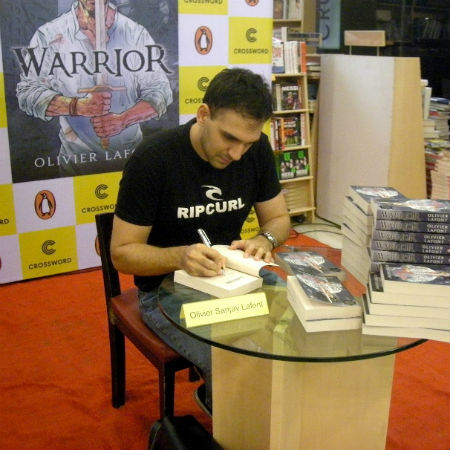 I had written Warrior as a screenplay, then turned it into a novel, and then I became busy with other work so the book was put aside for some time. When I picked it up again I just contacted various publishers, and got two great offers in the same week. Did you consider that having a single book for each part, making it a 3 – books series – for Warrior? Nowadays social media plays a vital part in book promotions also, and you see aggressive promotions these days? Video trailers for Books are also became almost required, how do you see this change? People seem to enjoy book trailers, so if that works that’s great, I recognise its usefulness as a marketing tool. I wouldn’t make my decision about buying a book based on its trailer, however, but if it made me aware of a story I might like, that’s good, that’s the marketing job done. Do you remember the first incident when someone asked you for the autograph for the first time, as an author? Can you share it with us. I’m inspired by living artists like Clint Eastwood, who’s had the most astounding career as an actor and then as a director. I have loved the works of long-gone luminaries like Shakespeare, who really set the standard for drama, literally and figuratively. There’s too many to name! Can you share something about your next book? I have several books near completion. Whereas “Warrior” is in a more adult space, I have written some young adult and children’s books which I think young readers would like. Would you like to share something from your end? You can reach Olivier though his official Facebook page and via his Twitter handle.